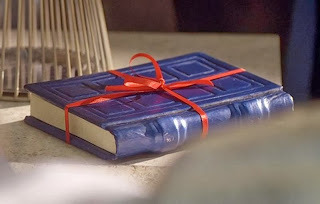 The one thing that has always bothered me about the encyclopedia re-cover prop tomes I have made is that although they look like tomes of eldritch evil, they look like brand new tomes of eldritch evil. And who wants a brand new tome of eldritch evil? Everyone knows that the really old books of eldritch evil are the only ones worth having, right? So, beginning with The Black Duke project, I started antiquing my tomes with "grime". I haven't actually done too many encyclopedia re-covers since then, but here is one that I did shortly after. It is not terribly innovative. In fact it is pretty much a copy of The Black Book of Evil, minus the straps and with weathering added. Sometimes when I'm not feeling particularly creative, but want to make something, I'll do a rip off of one of my previous designs as sort of a pallet cleanser. Quick and easy. Nothing new to figure out. I really just wanted to show the process of dirtying up the cover to simulate age. This is the first time I have tried it on a cloth cover. First I set the cover appliques in place and marked around them lightly with a pencil. I figured that around the edges of the raised bosses and centerpiece would be where most of the grime would build up. Then I used layer after layer of dry brushed acrylic paint dabbed all around where the appliques would go. I used several colors; black, brown green and purple mainly. Then I glued the appliques in place as usual, and added a little more around the edges, making sure to get a little on the appliques themselves, as they would show a grimy buildup too. This blends the line between the applique and the cover cloth. I also added some weathering around the edges of the book and along the spine to simulate shelf wear and handling. Since I didn't put any straps or hasps on this book, I did put in a decorative end paper, but the interior is still just an encyclopedia. This particular tome is currently available on the Rogue Cthulhu Prize Table.